I’m volunteering one day a week at the Juvenile Diabetes Research Foundation (JDRF) office in London (they have offices around the UK, and around the world) doing things like updating statistics and other sciencey stuff. This week we’ve got a Summer Science Show going on, where staff and supporters are sharing different kinds of information about type 1 diabetes on Facebook and Twitter, tagged with #TopT1Science. Today’s challenge is to show what type 1 diabetes is via a photo or a vine (Vine is a free app that lets you record six seconds of video – you can record it all in one go or do ‘stop-start’ and make a little film). I’ve never used Vine before but thought I’d give it a go. It took me a few goes to work out how to get it to start recording (there are lots of buttons on the screen and none of them seem to do that) but eventually I discovered that just touching the screen made it start recording. After a few false starts I figured out what went were and how it all worked. And… ta da! A few years ago I was at an event in Newcastle at an event about cell replacement therapies (eg stem cell transplants) and one of the activities for visitors was to make a cell in a Petri dish with plasticine, using different colours for the different bits of the cell. I was talking about research into islet cell transplantation and decided that instead of making a single insulin-producing beta cell I’d create one of the islets of Langerhans that’s found inside the pancreas. These contain several hundred beta cells, and lots of other cell types too, but in type 1 diabetes the beta cells are destroyed by the immune system. There aren’t enough left to produce insulin and so blood glucose levels begin to rise and the symptoms of type 1 diabetes appear. I wanted to recreate this for #TopT1Science and thought I’d use what I had to hand in the office (no Petri dishes or plasticine). My islet today is made out of a delicious M&S snack* which had lots of things of different colours in it. 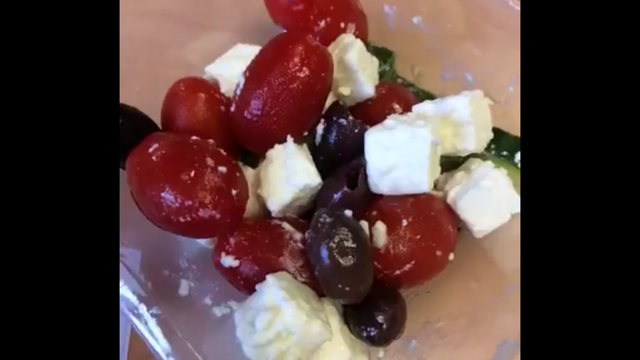 If it were an islet of Langerhans, what would it look like once the immune system had destroyed the beta cells (portrayed here by the feta cheese)? Well, a bit like this – with most of the feta cheese gone. Here’s a before and after screenshot. I’m not sure how successful the vine is at conveying ‘what type 1 diabetes is’ but storyboarding it was fun, also eating the props afterwards. 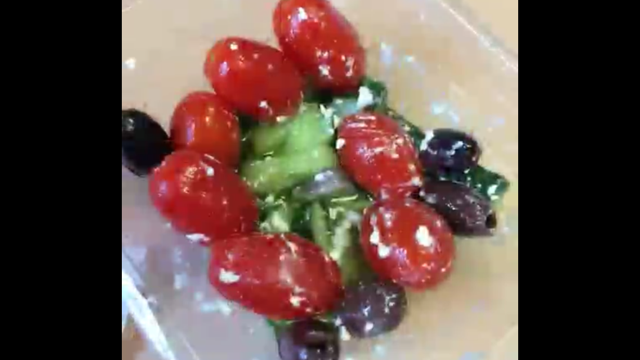 *Tomatoes, Cucumber, Feta Cheese and Olives (with a basil and mint oil dressing) – yum. Here’s some more information about the different type 1 diabetes research projects funded by JDRF in the UK. An adult pancreas contains around 1,000,000 islets which are tiny (Wikipedia says 0.2mm in diameter). Despite this huge number they make up only about 2% of the entire pancreas. The islets are scattered throughout the pancreas and contain several thousand cells clumped together to form a sphere. Their job is to produce a variety of hormones, including insulin. The remaining 98% of the pancreas produces some of the enzymes that digest our food. Hormones are sent directly into our bloodstream, digestive enzymes go into the gut. Islets are pretty complex things – they contain many different cell types, arranged in a particular way, and have their own blood and nerve supply. The insulin-producing beta cells make up the bulk of any given islet and tend to be clustered in the middle – these are the cells that are destroyed by the immune system in type 1 diabetes (which is an autoimmune disorder and separate from type 2 diabetes).